Wherever people congregate in large numbers there is always a potential danger to life. Perhaps there is no more serious example of this than the enclosed shopping centre where any outbreak of fire presents a serious hazard to both people and property. The range of goods stored significantly increases the risk from fire and the speed which fires can develop and produce significant quantities of heat. In 2013/14 alone there were 3000 fires in retail premises alone. The simplest way of providing protection for retail occupancies – and the people who might be there is by rapid application of water at the earliest possible stage of the fire. Approved document B states that all single storey, non-compartmented retail outlets with a floor area exceeding 2000 square metres require fire sprinklers. In addition to the legal requirements many other groups have recognised the value of sprinklers and fire brigades, insurers and safety organisations have all agreed that sprinklers can play a key role in reducing fire hazards in retail properties. 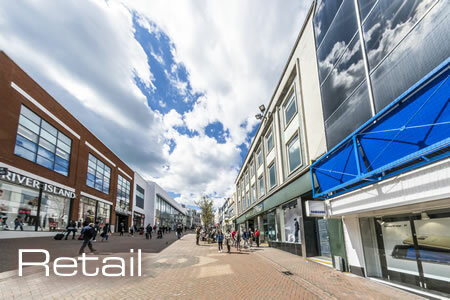 Triangle can design, install and commission a BS EN 12845 fire sprinkler system to retail properties and have recently completed an installation on behalf of TK Maxx.